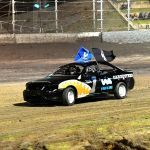 DESPITE chasing engine issues all night Kaiden Manders claimed the final of the Maddington Toyota Triple Crown at the Perth Motorplex on Saturday night. 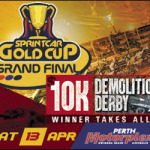 Manders took the win, which was also the Grand Final meeting of the Perth Motorplex, from Mitchell Wormall and Taylor Milling. Manders was one of two drivers who didn’t post a time in qualifying at the start of the show. He then pulled infield at the start of each of the heat races and as a result had to start from P16 in the 30-lap finale. By lap 10 he was up to seventh and progressively moved forward from there – also taking advantage of a restart when Daniel Harding and Brad Maiolo tangled on the main straight on lap 21 in front of him, putting Maiolo out with Harding sent to the rear. Manders and Wormall were locked in some entertaining duels for the lead before eventually the W60 pulled away to take the win by 2.6 seconds. 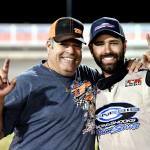 It was Manders’ second 410 feature race win of the season – and on the back of him also winning back to back Australian 360 Sprintcar titles. The race hadn’t even moved out of the first turn when the red lights came on – after Jamie Maiolo, who started from P4, got out of shape and landed on top of Danny Porter from the Northern Territory, putting them both out of the show as well as Todd Davis who had nowhere to go, and despite only minor damage, was unable to get a restart. Five laps in and it was Robert Watson junior who crashed out in the same area of the track, putting the red lights on again. Wormall, after trading spots with Dowling for a few laps, took the lead mid-race and then Dowling started to slip back off the pace a bit. On lap 21 Harding was coming on strong after starting from P11 but the contact between him and Brad Maiolo marred his strong run. Wormall lost the lead with a handful of laps remaining but he still looked strong and took a well-deserved second – his first podium finish in a 410ci car. Milling claimed his second podium placing for the season – a reward for putting in a solid season here in WA, getting more seat time and more comfortable in the W25 that makes the regular 600km trek from Kalgoorlie. Milling started from P10 and tried different racing lines at opposite ends of the track to make up some serious ground. Fourth was Jason Pryde who made up some spots after starting P8, with fifth being Harding who clawed his way back to respectably after being relegated and originally starting from P11. They were followed over the line by Tom Payet, Shaun Bradford, Ben Ellement, Sam Borlini, Liam Dowling and Tom Callaghan. Andrew Priolo was a non-starter after he crashed hard in a heat race. Harding claimed enough points over the three rounds of the Triple Crown to win the end-of-season mini-series. He claimed 424 points, taking the win from Jason Kendrick on 406, Manders 400, Jamie Maiolo 392 and Jason Pryde 390. Heat 1: 1st Jamie Maiolo, 2nd Mitchell Wormall, 3rd Brad Maiolo, 4th Taylor Milling, 5th Daniel Harding, 6th Tom Callaghan, 7th Sam Borlini, 8th Todd Davis, 9th Robert Watson. Heat 2: 1st Jason Kendrick, 2nd Jason Pryde, 3rd Ben Ellement, 4th Shaun Bradford, 5th Andrew Priolo, 6th Danny Porter, 7th Liam Dowling, 8th Tom Callaghan. Heat 3: 1st Robert Watson, 2nd Mitchell Wormall, 3rd Jason Kendrick, 4th Todd Davis, 5th Taylor Milling, 6th Liam Dowling. DNF: Shaun Bradford and Andrew Priolo. Heat 4: 1st Danny Porter, 2nd Ben Ellement, 3rd Brad Maiolo, 4th Daniel Harding, 5th Sam Borlini, 6th Jamie Maiolo, 7th Tom Payet, 8th Jason Pryde, 9th Tom Callaghan. DNF: Brad Maiolo, Jason Kendrick, Robert Watson, Danny Porter, Jamie Maiolo and Andrew Priolo. Stroy Credit – Darren O’Dea. FANDERLINDEN THERE AT THE START, AND HOPES TO BE HERE AT THE END FOR $10,000! SEASON COMES TO A GRAND CLOSE!